It’s hard to ignore the outburst of beauty that comes with spring. One of my favorite flowers are gladiolus and every year I watch my flower bed closely to catch the first glimpse of their glory coming out of the ground. Flowers are the best way to celebrate the arrival of spring. Being spring-inspired, I found some of my lighter colored yarn and started with the intentions of creating something dainty, just like new blossoms. If you’d like a stiffer earring, try starching the flowers before attaching them to the earrings. Repeat rounds 1-2 of first flower using color C instead of color A.
Sew a first flower and a second flower together at corresponding petals. Attach a jump ring to both flowers at the top stitch. Measure about 1 1/2” of chain and attach to jump rings. Attach both chains to one jump ring and then attach earring to jump ring. Repeat for second earring. If you happen to run into any problems, or just have a few questions, leave me your comments below and I’ll see what I can do! This entry was posted on Tuesday, May 6th, 2014 at 8:46 AM by Amy	and is filed under Free Crochet Patterns. You can follow any responses to this entry through the RSS 2.0 feed. You can skip to the end and leave a response. Pinging is currently not allowed. You have a beautiful collection of earrings patterns! They look like little hoya carnosa blossoms. 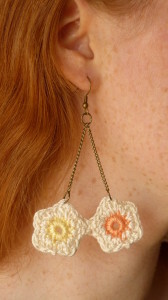 I generally don’t like crocheted jewelry, but these are really beautiful. Thank you Violet and Laura!